Either of these brushes offer excellent value for money from a leading brand within the electric toothbrush market. Neither are as heavily promoted as the Oral-B and Sonicare rivals and their prices almost seem too cheap in comparison. The materials and overall finish is a bit better from the other 2 brands, but the Colgate models are not exactly poor. The differences are relatively minor between these two models but the 250+ wins it just when considering the size, weight and overall performance for the price. The 350 comes with an extra cleaning mode, Deep Clean, in addition to the standard optimum mode available on both brushes. The 350 has a better battery life than the 250+. The 250+ comes with a travel cap. The 250+ comes in White, Black or Pink colour options, the 350 in White only. The 350 is available in 2 variants, one with a Deep Clean and one with a Whitening brush head. The 250+ comes with the Deep Clean head. The 250+ is the cheaper of the two. A common request from our readers is what is the difference between the Colgate ProClinical C250 and C350. As part of a refresh of the Colgate range of brushes in 2017, these product names have been altered slightly. The ‘C’ from the name has been dropped and the packaging updated to be a bit more modern. The 250 is now known as the 250+. For all intents and purposes the brushes are the same aside from the name and packaging, thus this comparison should encompass the difference between new and old models. Detailed Comparison: What’s the difference between the Colgate ProClinical C250 and C350? 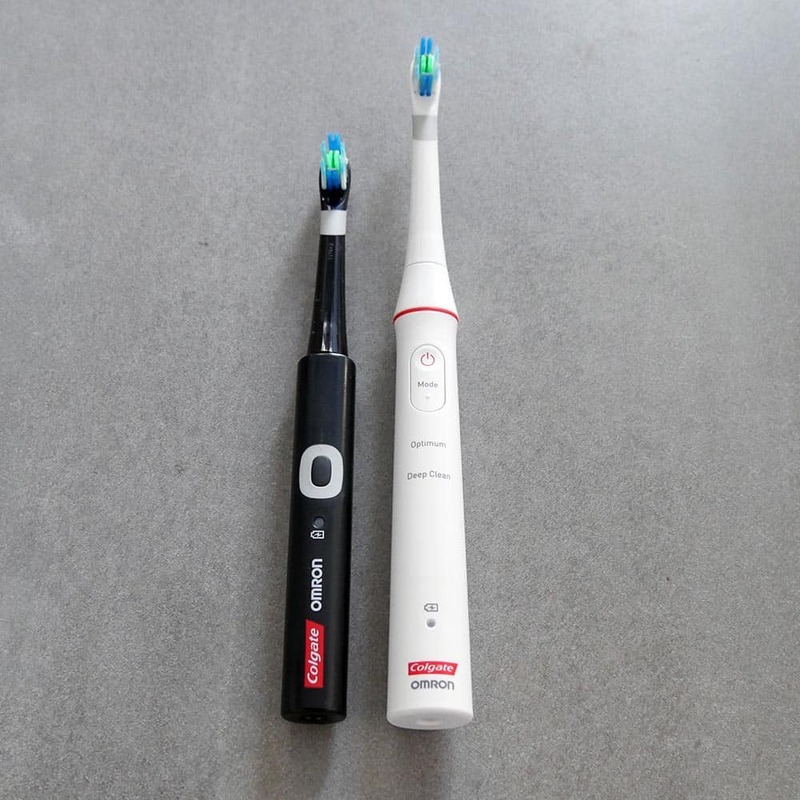 The first and most obvious differences between these two electric toothbrushes is the design, how they look and feel in hand. It is the 250+ that is the smaller, slimmer and lighter, with the 350 being heavier and taller. Here is how the two stack up in numbers. Neither are the most appealing in the way that they look, both are clinical looking, but in our opinion it is the 350 that is perhaps the smartest. Taller, with the angle to the neck and head of the brush to help reach the back of the mouth with more ease, a red coloured ring around the neck creates a stylish touch and break in the body. Both brushes are made of plastic and are a dullish White colour, not quite as glossy White as the competition. 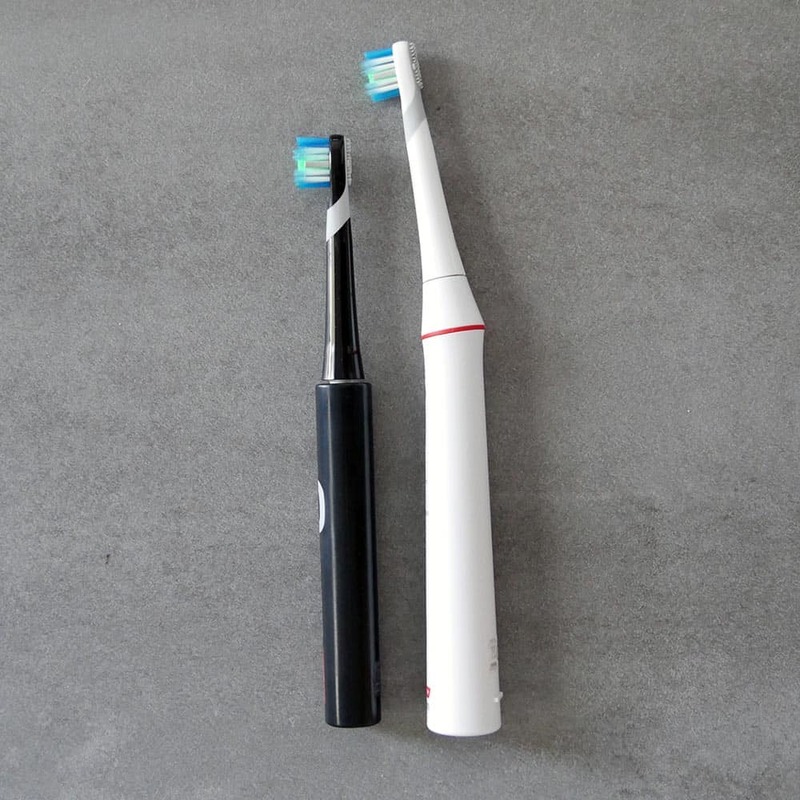 Both have a relatively slim and lightweight feel to them considering the battery is built into the handle, slimmer than Oral-B and Sonicare models. Where the 250+ has a single power button to turn the brush on and off, the 350 has what looks like one button, but is in fact 2 buttons built into one. It is a power button and a mode button to cycle between the two cleaning modes. It is the 2 cleaning modes that come on the 350 brush handle that is another differentiator between these two brushes. The 250+ comes with 1 cleaning mode, your standard clean mode, or as Colgate like to call it ‘Optimum’. The 350 has plus an extra Deep Clean mode. When in Optimum mode, the brush head pivots from side to side, up and down at a mid speed. Activate the Deep Clean and the brush moves up and down at high speed. When switching between the two modes, the power difference is noticeable not only on the teeth but in the sound from the brush. When set to Deep Clean the brush offers up to 35,500 strokes per minute, which is more than many of the Sonicare models. The clean from either brush is good. In our opinion the clean from the other brands ‘feels’ better, but that is not to say the slightly softer feeling movement of the Colgate’s is inferior. The 250+ boasts a very impressive 2 week battery life. This may seem pretty standard, but only when you see and handle the brush and see how slim it is does this seem particularly impressive. Being a little larger, the handle of the 350 accommodates a bigger battery and can last for up to 3 weeks, based on 2 cleans per day for 2 minutes. Both brushes have 2 minute timers, 30 second pacers and an automatic power off function built in. Rather than a large and bulky travel case, the 250 has in the box a moulded plastic sleeve that fits over the brush head and down the upper part of the brush handle to cover the power button. Basic and functional it keeps the size down. It does mean you can’t travel with a spare brush head like many other brushes, but this is not really an issue. The 350 does not come with any travel case in the box. The 250 is available in both a Black, White and Pink colour options. The Black and White have matching brush heads, whilst the Pink 250+ adopts the White coloured brush heads. Although subject to change the Black coloured heads tend to be a little more difficult to source. A single Deep Clean brush head is provided with the 250, and this is the same brush head that comes with the standard ProClinical 350. There is also a 350 Whitening option. The difference is the brush head supplied. The 350 Whitening comes with a 360 Whitening brush head. In any instance, the brush heads on either model are fully interchangeable and can be changed for any 1 of the 4 styles of head available from Colgate. Full details of the Colgate brush head range can be found in our ultimate guide. The final difference between these 2 models is the price, but more on that in a moment. If you were to use the same brush head on the same ‘optimum’ cleaning mode that is available on either brush handle, then there is no difference between the clean offered by these brushes. However, the 350 comes with the Deep Clean mode which offers more movements per minute than the standard ‘Optimum’ on the 250+, thus the results will likely be better for those using this mode. Pick up the 350 Whitening option and the provided 360 Whitening brush head will also help achieve different or better results to the 250+, subject to the mode used. Prices are always subject to change, but typically the 250+ is the cheaper of the two brushes as a result of not having that extra cleaning mode and the lesser battery life. Colgate’s Recommended Retail Price (RRP) is £10 different, with the 250+ set at £49.99 and the 350, £59.99. In reality, both models sell for less than RRP with typical purchase prices being £25 and £30-35 respectively. Given the relatively low initial purchase price and the price of the brush heads being favourable to, the daily ownership cost of either model hovers around 5p per day as a guide. Price is of course subjective and what you feel it is worth may well be different to somebody else. However we can safely say with either of these the are well priced and you are not being cheated. Shop around, you may get lucky and either could be cheaper than the typical selling price. Ultimately saying which brush you should buy is always a difficult decision for us, but if we have to pick one it is the 250+. The 350 is a good toothbrush, it cleans well, offers a good battery life and is a solid overall performer. It just however lacks something, a certain appeal or wow. Not that many brushes make you go wow, but the 250+ feels to be punching a bit more above its weight in price v features and the inclusion of the travel cap makes it nice and simple to take away with you and in all honesty either represent pretty decent value for money when compared to the other household names. To find out more about either of these brushes why not click the relevant links below to be taken to our hands on written reviews which include video or to one of our recommended outlets to purchase one at the best price possible. Ultimately either of the brushes discussed here will serve you well. You could spend more or less on other products from other brands and not be served so well. Either brush is available from a wide array out stores from high street pharmacists to online retailers, the prices of these brushes can vary considerably.